There are different types of instability and each one of these will be discussed. The release of instability causes air to accelerate in the vertical. This is the reason air rises so quickly to form thunderstorms. Instability is a condition in which air will rise freely on its own due to positive buoyancy. As an example, imagine a basketball at the bottom of a swimming pool. Once the basketball is released it accelerates upward to the top of the pool. The basketball rises because it is less dense than the water surrounding it. A similar process occurs when instability is released in the atmosphere. Air in the lower troposphere is lifted until it becomes less dense than surrounding air. Once it is less dense it rises on its own. The speed that is rises depends on the density difference between the air rising and the surrounding air. In any thunderstorm, rising motion is occurring since that air rising in the updraft of the storm is less dense than the surrounding air. This is instability caused by the release of latent heat. Latent instability increases as the average dewpoint in the PBL, or in the region that lifting begins, increases. The more latent heat that is released, the more a parcel of air will warm. If the PBL is very moist and humid, the moist adiabatic lapse rate will cause cooling with height of a rising parcel of air to be small (perhaps only 4 C/km) in the low levels of the atmosphere. A storm with an abundant amount of moisture to lift will have more latent instability than a storm that is ingesting dry air. Often storm systems and storms will intensify once they get to the east of the Rockies because more low level moisture becomes available to lift. A Nor-easter is a classic example of latent instability. Warm and moist air from the Gulf Stream or Gulf of Mexico increases latent instability. Convective (also called potential) instability occurs when dry mid-level air advects over warm and moist air in the lower troposphere. Convective instability is released when dynamic lifting from the surface to mid-levels produces a moist adiabatic lapse rate of air lifted from the lower troposphere and a dry adiabatic lapse rate from air lifted in the middle troposphere. Over time, this increases the lapse rate in the atmosphere and can cause an atmosphere with little or no Surface Based CAPE to change to one with large SBCAPE (relative to a parcel of air lifted from the surface). Dry air cools more quickly when lifted compared to moist saturated air. Convective instability exists when the mid-levels of the atmosphere are fairly dry and high dewpoints (and near saturated conditions) exist in the PBL. Water vapor imagery detects moisture in the 600 to 300 millibar range in the atmosphere. A dark color on water vapor imagery implies a lack of moisture in the mid and upper levels of the atmosphere. The surface, 850 mb, and 700 mb charts can be used to assess the low level moisture profile. The best way to analyze convective instability is by the use of a Skew-T diagram. A hydrolapse (rapid decrease of dewpoint with height) will exist at the boundary between the near saturated lower troposphere and dry mid-levels. There will often be an inversion separating the dry air aloft and the moist air near the surface. The dry air aloft is commonly referred to as the elevated mixed layer (EML). This inversion is important because heat, moisture and instability can build under this "capping" inversion during the day. Once the cap breaks then explosive convection can result. 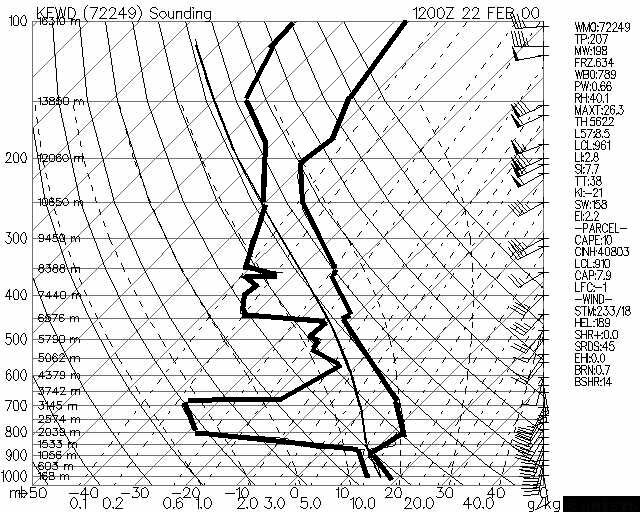 Below is a sounding displaying convective instability. The morning sounding shows no significant CAPE. However, a forecaster would expect daytime heating to increase SBCAPE. If lift also occurs in this sounding environment (from dynamic lifting mechanisms such as WAA, low level convergence, upper level divergence (jet streak, PDVA)) then CAPE will increase even further because the lifting will cool the mid-levels at a rate greater than the low levels.